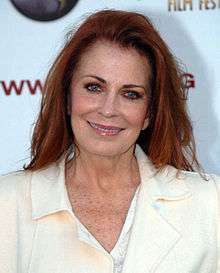 Joanna Cassidy (born August 2, 1945) is an American film and television actress. She is best known for her roles as the replicant Zhora in Ridley Scott's film Blade Runner (1982) and Dolores in Who Framed Roger Rabbit (1988). She has won a Golden Globe Award, was nominated for three Emmy Awards and also was nominated for Saturn Award and Screen Actors Guild Awards. Cassidy also has starred in films such as Under Fire, The Fourth Protocol, The Package, Where the Heart Is, Don't Tell Mom the Babysitter's Dead, Vampire in Brooklyn and Ghosts of Mars. From 2001 to 2005, she played Margaret Chenowith on the HBO drama series Six Feet Under. From 2011 to 2013, she played Joan Hunt on the ABC series Body of Proof. Cassidy was born Joanna Virginia Caskey in Haddonfield, New Jersey, the daughter of Virginia and Joe Caskey. She attended Haddonfield Memorial High School, and has described herself as being "a rowdy kid" there. She is known for her infectious, howling laugh which can be heard in the film The Laughing Policeman and on her appearances on The Tonight Show Starring Johnny Carson. Cassidy majored in art at Syracuse University. During her time there, she married Kennard C. Kobrin in 1964, a doctor in residency, and found work as a fashion model. The couple moved to San Francisco, where her husband set up a psychiatric practice while Cassidy continued modeling. In 1968, she landed a bit part in Bullitt. Following her divorce in 1974, Cassidy decided to move to Los Angeles. Cassidy's first film appearance was in The Outfit (1973). She appeared in a 1973 Smokey Bear public service announcement (PSA), and in such television series as Mission: Impossible, Starsky & Hutch and Taxi. She had a small role in Stay Hungry (1976), a film about bodybuilding which featured a young Arnold Schwarzenegger. Cassidy was considered for the role of Wonder Woman for a television series, but lost it to Lynda Carter. She co-starred in the 1978 film Our Winning Season. Her first regular role was as sheriff's pilot Morgan Wainwright in the action-adventure series 240-Robert (1979), although the series only lasted for two abbreviated seasons. Afterwards, Cassidy continued to appear in guest roles in series such as Dallas, Falcon Crest, as well as a regular role in the short-lived 1983 sitcom Buffalo Bill (for which she earned a Golden Globe Award). She starred in the short-lived 1985 NBC television series Code Name: Foxfire. In 1982, Cassidy had her first major feature film role (what about Bank Shot?) as the replicant Zhora in Ridley Scott's Blade Runner. The following year, she co-starred in Under Fire with Gene Hackman and Nick Nolte. She continued to appear in both films and television; she co-starred in the television miniseries Hollywood Wives (1985), and appeared in The Fourth Protocol (1987), Who Framed Roger Rabbit (1988), 1969(1988),The Package (1989), Where the Heart Is (1990), and Don't Tell Mom the Babysitter's Dead (1991). In 1993, she co-starred with Dudley Moore in the sitcom Dudley, but the series only lasted for six episodes. She played the ex-wife of James Garner's lead character in the television movie, The Rockford Files: I Still Love L.A. (1994). Other screen credits from this era include Barbarians at the Gate (1993), the 1993 miniseries adaptation of Stephen King's The Tommyknockers, and Wes Craven's Vampire in Brooklyn (1995). Cassidy also provided the voice of Inspector Maggie Sawyer in the WB's series Superman: The Animated Series, and had recurring guest roles on television shows such as L.A. Law, Melrose Place, Diagnosis: Murder and The District. Since 2000, Cassidy has appeared in the 2001 film Ghosts of Mars directed by John Carpenter, and had a recurring role as Margaret Chenowith on the HBO drama series Six Feet Under, for which she received an Emmy Award nomination. In 2004, she guest-starred in two episodes of Star Trek: Enterprise as T'Les (the Vulcan mother of Enterprise crewmember T'Pol) and she had a recurring role as Beverly Bridge on the series Boston Legal in 2006. She voiced the villainess, Hecubah, in the computer game Nox (2000) as well as once again voicing the character of Maggie Sawyer in the 2002 video game Superman: Shadow of Apokolips. In the spring of 2007, Cassidy donned Zhora's costume once more, 25 years after the release of Blade Runner, in order to recreate a climactic scene from the film for the fall 2007 Final Cut release of the film. In the original 1982 release, a stunt performer played out Zhora's death scene, with the physical differences between the performer and Cassidy very evident (including the stuntwoman wearing a different wig). For the Final Cut, Cassidy's head was digitally transposed onto footage of the stunt performer, making the death scene fit continuity. According to the DVD featurette, All Our Variant Futures, it was Cassidy herself who suggested this be done; she is captured on video making the suggestion during filming of a retrospective interview related to Blade Runner. In the second season of the NBC series Heroes, she is seen in a photo of the twelve senior members of the show's mysterious company. Beyond appearances in photographs, the actress first appeared as Victoria Pratt in the tenth episode of season two, "Truth & Consequences", during which her character was killed. In 2008–2009, Cassidy appeared in episodes of Ghost Whisperer, Desperate Housewives, Law & Order: UK, and was also seen in the recurring guest role of Amanda Hawthorne, the mother-in-law of Jada Pinkett Smith's eponymous character in the medical drama HawthoRNe. In 2011, Cassidy began to appear in a recurring role on the ABC series Body of Proof as Judge Joan Hunt, the mother of Megan Hunt, Dana Delany's character in the show. The series was canceled by ABC after three seasons in May 2013. 1976 McCoy Unnamed role Season 1, Episode 5 – "New Dollar Day"
1978 Taxi Beverly Episode: "High School Reunion"
1978 Starsky and Hutch Harry / Monique Episode: "The Avenger"
1979 The Love Boat Joan Horner Episode: "Gopher's Greatest Hits/The Vacation/One Rose a Day"
1979 Kaz Unnamed role Season 1, Episode 18 – "A Piece of Cake"
1980 Hagen Eve Season 1, Episode 7 – "The Rat Pack"
1980 Insight Lucy Episode: "Resurrection"
1980 Trapper John, M.D. Dr. Carson Whitaker Episode: "Warning: I May Be Hazardous to Your Health"
1981 Trapper John, M.D. Maggie Holtz Episode: "C.O.D." 1981 Charlie's Angels Stacy Episode: "Hula Angels"
1981 Enos Unnamed role Season 1, Episode 10 – "The Head Hunter"
1981 Hart to Hart Belle Episode: "Slow Boat to Murder"
1981 Flo Billy June Episode: "Footsie"
1982 Strike Force Eve Murphy Episode: "Turnabout"
1982 The Love Boat Dr. Lisa Lessing Episode: "I Don't Play Anymore/Gopher's Roommate/Crazy for You"
1982 Lou Grant Barbara Costigan Episode: "Charlie"
1983 Family Tree, TheThe Family Tree Elizabeth Nichols Episode: "1.2"
1983 Fantasy Island Christine Donovan Episode: "Nurses Night Out"
1992 Northern Exposure Solvang Planey Episode: "The Three Amigos"
1992 Ray Bradbury Theater, TheThe Ray Bradbury Theater Lavinia Episode: "The Lonely One"
1993 CBS Schoolbreak Special Linda Jurgenson Episode: "Other Mothers"
1994 Burke's Law Liz Charles Episode: "Who Killed the Beauty Queen?" 1994 Murder, She Wrote Willie Greenwood Episode: "Roadkill"
1998 Rude Awakening Colleen Woods Episode: "TV Mom"
1998 Hunger, TheThe Hunger Grace Wallace Episode: "The Other Woman"
1999 Twice in a Lifetime Christine Esposito Episode: "Quality of Mercy"
2000 Rude Awakening Colleen Woods Episode: "Star 80 Proof"
2001 Philly Marian Marshall Episode: "Pilot"
2003 Less Than Perfect Norma Season 1, Episode 12 – "Claude's Got a Secret"
2003 Hidden Hills Carol Season 1, Episode 11 – "The Visit"
2003 Everwood Evelyn Rowser Episode: "The Price of Fame"
2007 Heroes Victoria Pratt Episode: "Truth & Consequences"
2008 In Plain Sight Deandra Bevins Episode: "Never the Bride"
2008 Ghost Whisperer Faith Clancy Episode: "Threshold"
2008 Criminal Minds Mrs. Holden Episode: "52 Pickup"
2009 Desperate Housewives Melina Cominis Episode: "Home Is the Place"
2010 Notes from the Underbelly Kay Episode: "The Circle of Life"
2012 Franklin & Bash Captain Gina Vaughn Episode: "Summer Girls"
2015 Married Sharon Episode: "The Cruise"
2016 The Odd Couple Judy Season 2, Episode 7 – "Make Room for Dani"
2016 Lady Dynamite Barbara Episode: "Jack and Diane"
↑ NetIndustries, LLC. (2007). "Joanna Cassidy Biography (1945–)". NetIndustries, LLC. Retrieved October 1, 2007. ↑ "Explore Historical Newspaper Archives Online - NewspaperARCHIVE.com". newspaperarchive.com. ↑ Staff. "Joanna Cassidy at reunion remembers self as a rowdy kid", Lakeland Ledger, November 27, 1983. Accessed July 10, 2011. "Actress Joanna Cassidy, star of the movie Under Fire, remembers being 'a rowdy kid' at Haddonfield Memorial High School two decades ago." 1 2 3 Joanna Cassidy biodata, yahoo.com; accessed November 30, 2014. ↑ James Christopher (September 3, 2007). "Blade Runner: The Final Cut". London, UK: Times Online. Retrieved October 1, 2007. ↑ Carolyn Giardina (2007). "Cutting a new 'Blade': No bloodshed allowed". The Hollywood Reporter. Archived from the original on October 15, 2007. Retrieved October 1, 2007. Wikimedia Commons has media related to Joanna Cassidy.